During the holiday season, even the not-so-crafty get the urge to make homemade cookies, cakes and holiday decorations. These simple Hanukkah crafts will leave you with cute decorations for your home, and memories of creating them with your children that will last a lifetime. 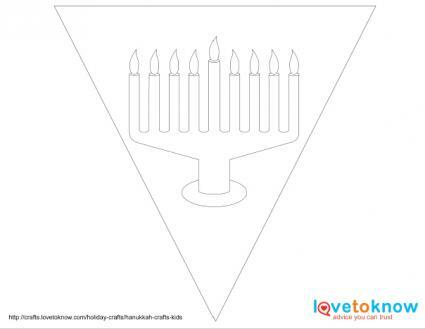 This simple color-and-cut project creates a customized banner to add to your Hanukkah decor. Make it short by printing out only one or two sets of images, or make a long banner by print out more. This craft is suitable for children ages 2 and up, though younger kids will need help with the cutting. It should take approximately 30 minutes to 1 hour to complete, depending on how many images you choose to color. Decide how long you want your banner to be, then download and print the appropriate number of pages by clicking on the image to the right. For help downloading the printable, follow these helpful tips. Regular white copy paper will work fine, but if you want a sturdier banner that will last for several years, print it on heavy white card stock. Color each image using crayons, markers or colored pencils. Punch a hole in the top of each triangle. Set images out in desired pattern. Weave ribbon or yarn through holes to create a hanging banner. Tie loops at each end of the ribbon to secure the sections and to use for hanging your banner. Note: If you don't have cardstock handy and want to make your banner last a little longer, cut out cardboard triangles to match the size and shape of the banner triangles and glue the colored banner sections to the cardboard. Allow the glue to dry before hanging. Hanukkah celebrates the rededication of the Second Temple in Jerusalem following the defeat of the Greeks and Syrians, who prohibited the Jewish people from practicing their religion. Following the rededication, one night's worth of oil kept the lights on the temple's menorah flickering for eight days. Today, the menorah is lit for eight nights during Hanukah in remembrance of the miracle. In this craft, your child's hands and fingers are used to make the base of the menorah and the eight candle holders. The thumbs are the shamash, which is the middle candle that is used to light the other candles. Your child's thumbprint will make the candle flames. The craft is suitable for any age, and should take between 10 and 15 minutes. Thoroughly wash and dry your child's hands. 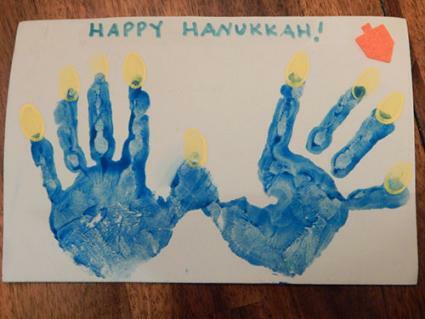 Paint both of your child's hands and fingers the desired color for the menorah. Put your child's hands together, with fingers spread out and thumbs either overlapping (to create a thin shamash) or next to each other (for a thick shamash). Press painted hands gently but firmly onto canvas or paper. Gently roll them on the canvas to ensure an even coating of paint. Wash and dry your child's hands once again. Paint the pad of your child's thumb the desired color for the candle flames. Press thumb gently but firmly above each "candle," rolling to ensure an even coating of paint. Repeat step 7 until all eight candles are complete. The Star of David is one of the most recognized symbols of Judaism. Here, you can make a simple Star of David decoration to hang in your home. This craft is perfect for children age 2 and older (though very young children will need assistance) and should take approximately 15 minutes to complete (excluding drying time). Using three craft sticks, create a triangle by overlapping the ends and gluing them together. Repeat with another three sticks. Lay the triangles on paper plate or paper towel. Spread a thin coat of glue on each craft stick. Sprinkle liberally with glitter. Let dry. Turn one triangle so that a flat side is at the top and a point is facing down. Place it on top of the other triangle which should be facing point-side-up and flat-side-down. The tip of the inverted triangle should sit below the bottom of the other triangle (you should be able to poke your finger through the space). Use the image at the right for help with placement. Glue in place, then allow the glue to dry. Once dry, loop ribbon or string through top of triangle and tie in a bow. Once complete, each of these crafts will become part of the holiday decorations you pull out from year to year. You and your children will enjoy marveling at how tiny their hands were and how messy the glitter got as you remember the happy times spent together creating these simple treasures.